Tasty melt in your mouth tender beef barbacoa in a burrito salad bowl with avocado cilantro lime rice, pico de gallo and beans. Whenever I make something like beef barbacoa I like to make a double or even a triple batch so that I have plenty of leftovers to enjoy either in the original dish or as an ingredient in other recipes. This works especially well with Mexican style meats since they can be used in so many different ways, say from tacos, to quesadillas, burritos, tostadas, etc. 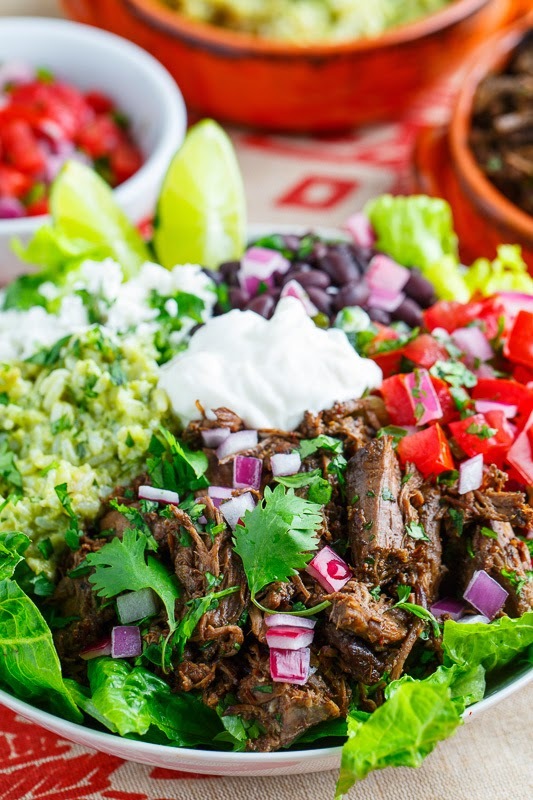 When I made the barbacoa beef I made a lot of it and one of the first things that I did with the leftovers was use them to make these super tasty barbacoa and avocado cilantro lime rice burrito salad bowls. 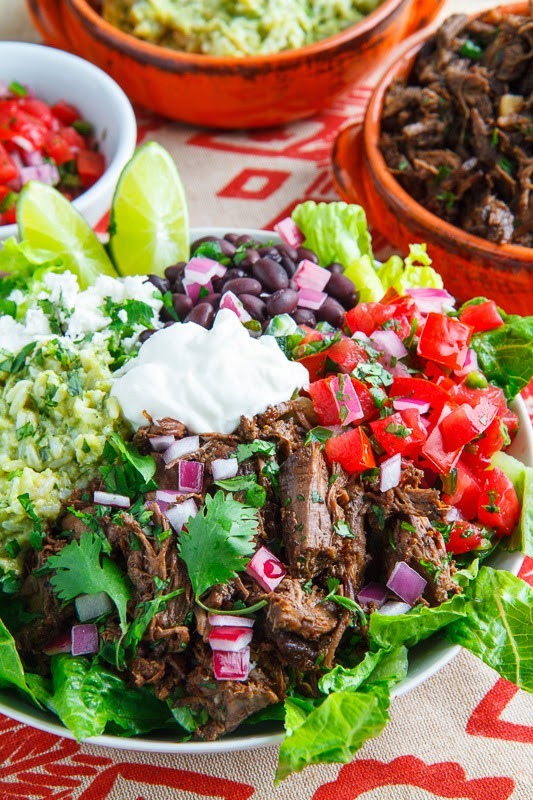 You can never go wrong with a hearty salad for dinner, especially in the summer, and meat like the beef barbacoa is always a welcome addition. I themed this particular salad bowl based on burritos and filled it out with some avocado cilantro lime rice, pico de gallo, beans, cheese, sour cream and fresh cilantro making for one really satisfying meal! A Chipotle barbacoa burrito bowl copycat! Assemble the burrito bowls as desired and enjoy! Option: Add your favourite burrito fillings like salsa, cheese, etc. Looks wonderful. The meat is incredibly flavorful and beautiful addition to all these other flavors, colors and textures. P.S. Following you on instagram now. Now I want Chipotle for lunch!